Are your kids’ fans of spooky ghost stories, exotic adventures and making new friends? if they are, they’re going to love this brand NEW episode of the Reading with Your Kids podcast! Our guest today is children’s author and storyteller P. Tomar. She writes stories for children based on adventure, magic, and mythology. She is joining us to talk about her first picture book Babu and Bina at the Ghost Party. Pragya’s book is suitable for ages 4-8 years old. The first book in the Babu and Bina series, Babu and Bina at the GhostParty tells a simple story of sibling elephants Babu and Bina Trunkvisiting an East Indian fort with their family. Pragya’s book has been #1 new release on Amazon in “Children’s around the world” category for four weeks. In our exciting interview, Pragya discusses”Babu and Bina at the Ghost Party”, that is based on her childhood in India. It’s a story that highlights Indian History with a magical adventure. 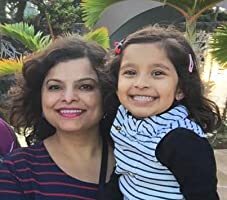 She hopes through these picture books, children can enjoy unique stories and places in India! Listen in to join Babu and Bina on the first of many adventures to come! P Tomar writes stories for children based on adventure, magic and mythology. She is a Visual FX Artist by the day, passionate storyteller by night. For the past six years, she has been working at Nickelodeon Animation, inspired every day by the best in the industry. Born and raised in New Delhi, India, P.Tomar came to USC Film School in 2003 for MFA in Film, Video and Computer Animation. She received the prestigious Sloan award in Animation at USC in 2006. She has worked on many feature films and TV shows including Disney’s Bolt, A Christmas Carol, Cloudy with a chance of meatballs, Star Wars, Transformers 3, Kungfu Panda, Nickelodeon’s TV show WallyKazam and Shimmer and Shine. What do elephants and ghosts have in common? They both love a hip dance party! Meet Babu and Bina, spirited young elephant kids who love exotic adventures, making new friends, and of course dancing! When these two curious elephant kids get themselves trapped in an isolated cavern, they stumble upon the ancient ghost of a great Maharaja, the king! But instead of being afraid of the ghost, Babu and Bina make a bargain – and that’s where the fun begins. This colorful, imaginative picture book, will take you back in time! A story that highlights Indian History with a magical adventure. It combines the spirit of The Polar Express by Chris Van, Matilda by Roald Dahl and family fun of Robert Munsch books. What does Pragya’s book have to offer that both kids and parents will love? Pragya talks about her book promoting diversity and multiculturalism and the rich Indian History of Maharajas and Maharanis. What kind of reactions she has been getting from parents and children for Babu and Bina at the Ghost Party? A little preview of her second picture book in the Babu and Bina series, future projects and much more. A big thank you to P. Tomar for joining us and sharing her story! So, there you have it. We’re sure you’ve enjoyed learning about Babu and Bina at the Ghost Party as much as we did! If you’ve enjoyed this episode then please rate and review our show in iTunes and share it by clicking the social media buttons at the bottom of this page!